What Do You Expect In Your Stocking? Christmas carol singing began around October. Ma also rearranged things to make room for decorations and the big tree that sat behind the large picture window in our home. Even in central Florida, Mom went all out decorating for Christmas. Several times a year, we made Sunday afternoon trips to The Christmas Store in Brooksville. Each year, her Christmas displays grew to envelop more and more of the house. Dad told me it was her dream to have a “Christmas Room” in her home where she could display Christmas year-round. By the time I became a part of the family, Mom’s voice had grown raspy from surgery to remove polyps from her vocal chords. Still, when she sang about her Savior and King, her voice filled with love and compassion. She had a sweetness that mamas around the world are known for. She almost danced as she busily decorated every room in our home. People knew Theresa Marcella Adams for her kindness, generosity; and for greeting everyone she met with a smile and kind word. I grew to love my mom even more for her joy and her wonderful sense of humor. Her favorite song at Christmas time was “All I Want for Christmas is My Two Front Teeth”, written in 1944 by Donald Yetter Gardner. Such a smile would come across her face as she attempted to lisp the word Christmas. It was almost impish as it brought forth her mischievous nature and her child-like joy. Each year, Mom found a new craft project to do during November and December. She made clothespin angels, little lace doohickeys to hang on the tree, and hand-painted ornaments. My all-time favorite was the small zipped plastic bags with a few mini-marshmallows inside. 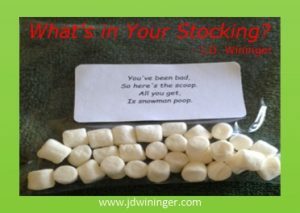 On each bag was a sticker; ” You’ve been bad so here’s the scoop; All you get is snowman poop.” Laughter erupted as each of us reached into our stocking to pull this out and read it aloud. I’ll never forget our dad stating with a loud laugh, “That beats a lump of coal every time!” My heart warms each time I picture her warm smile and twinkling eyes when she would laugh. Mom made her way into heaven’s glory in December 2003. Each Christmas since brings a mixture of joy and sorrow for our family. Whenever I hear a quirky song, or look to see one of her famous handmade decorations, her love comes shining through. May joyous memories of Christmases past fill your heart; and may God bring you new and joy-filled memories with this year. Let us remember to keep Christ in CHRISTmas this and every year. Thank you for the kind words Ms. Debbie Bookout. I think, perhaps, the best we can hope for in this life is great memories of living a life fulfilled. Merry CHRISTmas ma’am. Adding joy and laughter is so important. Reading your memories reminded me how much my mom enjoyed Christmas. Thank you for sharing heartfelt memories. Thank you Ms. Jeannie. Prayers that this CHRISTmas gives you lots more wonderful memories. Very strange…when moving I found a scrap of paper in a drawer. The only thing on it was a name. Theresa Marcella Adams. I did not know who this was and through it out. But I did remember the name. ?? ?was God trying to tell me something. I also wanted to thank you for the bookmarks, they are already in my bible. Thanks for your beautiful memories of your mom. Moms are wonderful people, miss them so. Thanks again for everything. God bless you all and have the most blessed Christmas ever. Ms. Joyce. I accept your premise that the note was God’s message to you this morning. Am thinking that maybe you wrote my mom’s down back in 2003 as part of a prayer request when my Mom ascended to heaven’s glory. Your sister Ms. Jan was one of the first people I called to share the news and ask for prayers. What a wonderful blessing you have given me this morning. God’s blessings and Merry Christmas ma’am. Loved reading your memories of “Ma”, She reminds me of my mother and my wonderful memories of Christmas. I miss my mother every day, but I’m thankful for the memories. Thank you for sharing this picture of joy, hope, and love. That’s what Christmas is all about! Thank you so much for your kind words Ms. Katherine. May God bring you many warm and joyous memories, and lots of new ones, this CHRISTmas. I love those white-haired “grannie” people. We’re full of wisdom, knowledge, and the best hugs in the world. Merry CHRISTmas Ms. Jackie, and Mr. Jackie. J.D. Your post brought tears to my eyes as I remember my sweet Mom who always sported a “Jesus is the reason for the season” pin at the holidays. Thanks for sharing this beautiful memory and a great reminder to cherish our loved ones and WHO the season is truly about: JESUS. Awww… I pray they were tears of joy Ms. Beckie. God’s blessings ma’am; and Merry CHRISTmas!